Melanie and I are such big fans of Downton Abbey and we're having a blast recaping the episodes each week and discussing what happens. 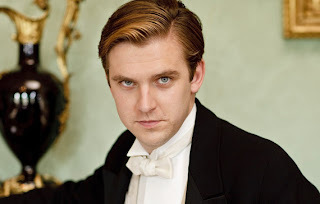 Be sure to check out our Downton Abbey Episode Four Recap over at Melanie's blog this week! And if you haven't watched Downton Abbey yet-what are you waiting for? About the Book: May has been sent to a neighbor's homestead to help out. It's only for a few months and it's a way her family can earn some extra money. Plus, it's not like she's doing much in school anyway-she's having trouble reading, so why does she need school? The neighbor's new bride isn't liking life on the Kansas prairie and she needs help cooking and cleaning. But when a tragedy leaves May alone as winter approaches, May must rely on her wits to survive. 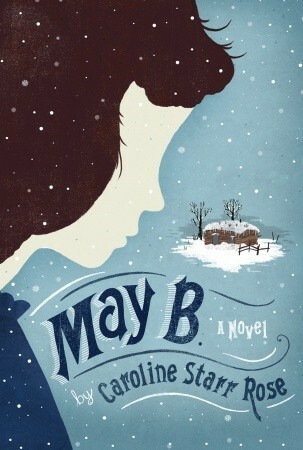 GreenBeanTeenQueen Says: May B is a book that appeals to my tween self. 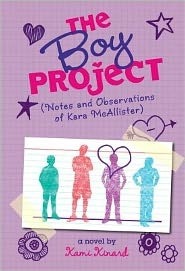 If I had read this as a tween, I would have devoured and loved. I was obsessed with Laura Ingalls Wilder and living on the frontier (of course it was much more glamorous in my mind!) so this book was right up my ally. 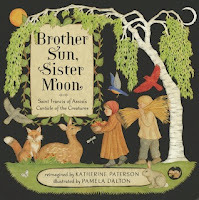 May's story is told in verse which packs a powerful punch to May's journey. It works well because for most of the novel, May is alone, trapped in a snowstorm and trying to survive. I tend to not like books with little dialogue and with May on her own for most of the story, there's not a lot of dialogue happening in this book. But the verse format worked well for the story. It shows the seriousness of May's situation-she is alone and trying her best to survive. I felt May's emotions and related to her more with the verse poetry. 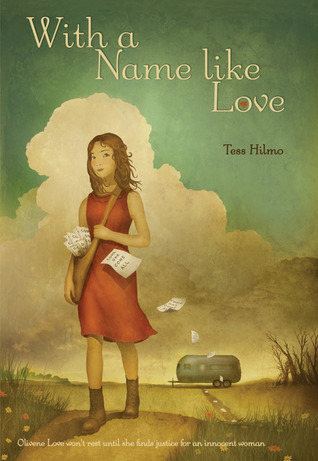 Each poem was like a glimpse into her thoughts instead of reading one long passage of her internal narration. I'm probably not describing it very well, but it worked wonderfully to help tell this story! There's also a storyline that deals with May's dyslexia. May dreams of growing up and becoming a teacher, but she can't read. She's always had trouble in school and she had one teacher who has encouraged her dreams and one who has not. May has a difficult time trying to figure out who to believe and if she should hang onto her dreams of teaching. The nice thing is that her struggle with dyslexia isn't laid out all at once and told to us. We're shown slowly throughout the novel that May is struggling in school. This works well because we come to discover May's dyslexia by it being shown to us instead of being told. The frontier aspect of the story will have lots of appeal to fans of historical fiction. May describes the household, the landscape and her struggle to survive in beautiful historical detail. Seriously, my frontier loving tween self would have loved this. I would have finished this book and immediately started planning what I would do if I were trapped in the snow! I would hand this book over to readers of Little House on the Prairie who I'm sure would love it. Over the weekend, there was lots of discussion about drama at the ALA Midwinter Meeting. I feel as though my thoughts wouldn't add anything new, especially when two bloggers/librarians have written excellent posts. If you haven't already, read Kelly from Stacked and Jennie from Biblio File posts. I think a discussion needs to happen about conference etiquette and the fine line between bloggers and librarians. I find this discussion fascinating, since I'm a blogger and a librarian. And be sure to comment-both have great discussions happening! This January, I finished up my second term on Fabulous Films for Young Adults (FFYA). I can't tell you how many times over the course of my two years on this committee that I heard "what do movies have to do with libraries?" A lot actually! Did you know that libraries have movies available for check out? And that lots of libraries also check out TV Shows? Did you know that libraries even host movie programs? Sometimes it's a chance to catch a movie you may have missed on the big screen on another big screen (or at least a medium screen-we show ours via our Auditorium Projector. I also love the Kansas City Public Library Main Branch-the library was a bank before it was a library and the library converted the vault into a small theater perfect for movie showings!) Or what about libraries who show movies and host movie discussions or book to movie discussions? And even libraries who host family movie events including sing-a-longs of popular films! The goal of FFYA is to provide a selection tool for librarians and teachers as well as a program guide. Each year the committee chooses a theme. Nominations are accepted from committee members as well as the general public. Anyone can fill out the nomination form and nominate a title! (This is true for most YALSA committees, so get your nominations in this year!) This year's theme was Song and Dance. Throughout the year (from February to December) the committee takes nominations, watches and discusses the films. At the Midwinter Meeting, our committee met over two days to discuss and narrow down our list of films to 25 (we had over 100 films nominated!) If we wanted to watch part of a film, we could do so if we felt we needed a refresher. We also had the option to watch films at the meeting if the majority of committee members hadn't seen a nominated title. Our committee did a ton of work throughout the year, so we had a majority vote on all of our films! We did do a lot of refresher watching though. We started off with an initial vote-yes or no and counted maybe's as yes. We then had the opportunity to discuss each film with each member who wanted to say something having the chance. Then we would vote again. And again, and discuss, and vote and discuss, and vote until we had our final list of 25 Fabulous Films for Young Adults. This year the committee decided to create read alikes and listen alikes that we will be sharing throughout the year. I really like this idea of tying films together with books and think it help librarians as they plan programs. I loved my time on FFYA! It was a fun committee to be on (you get to talk about movies!) and I got to hang out with some very cool people! Seriously, our committee rocked! If you're looking to get involved in YALSA, I highly recommend FFYA-it's a fun committee and great way to get started in committee work. If you're not a member of YALSA, you can still contribute to FFYA by nominating titles. I wish this year's committee the best of luck! Didn't I get a chance to do anything else but have meetings at Midwinter? Yes, I did. I got to attend three different publisher breakfasts which not only are a great way to network and eat yummy food, but also to find out about upcoming titles for kids and teens. I love these breakfasts because I come away with lots of notes about books to order and tell my staff about. I also love hearing the publisher comments about titles, especially the it's this meets this blurbs they give. I also attended Random House's publisher preview which wasn't a breakfast, but a fantastic preview anyway without the food! I got to catch up with my wonderful ILOAs (my fabulous network of librarian friends who are the most brilliant, creative and supportive librarians I know!) We had several meals together and late evenings of talking and catching up which was a blast, especially since I only get to see them twice a year! And of course, a trip to the exhibit hall was in store opening night. It was crazy and I left early-it was a mad house! Last year's Midwinter was much more laid back and this year seemed so much crazier and it wore me out very quickly-plus I had a committee meeting to get to! Bright and early Monday morning I attended the Youth Media Awards! I also did lots of networking and talking with fellow librarians who I know only online and talking about books library programs, and YA services. 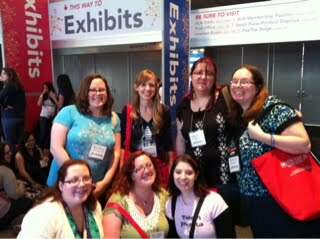 If you're a librarian who has never been to ALA or hasn't been involved in ALA, I highly, highly recommend it! There's nothing better than getting together with other librarians and talking about what you love and coming back to your library with new ideas. ALA is always an exhausting few days, but it's well worth it! 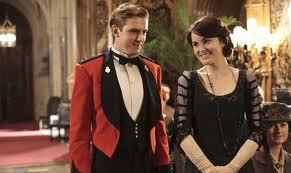 -Melanie at Melanie’s Musings and I have been blogging and discussing about Downton Abbey Season 2. Be sure to catch Melanie’s recap of what we both agree was the best episode so far this season! 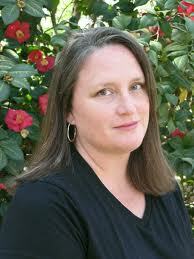 --Jandy Nelson’s debut novel, The Sky is Everywhere, has a big name star attached to the movie adaptation. Selena Gomez is attached to produce the film and most likely star. -The Michael Buckley tween series, Nerds, is heading to the big screen thanks to Elton John’s production company, Rocket Pictures. --From Cynopsis Kids, ABC has approved a one hour drama titled 666 Park Ave, based on a series by Gabriella Pierce. The series is from Alloy Entertainment who also produce The Vampire Diaries, The Secret Circle and Gossip Girl. The series is about a Midwestern couple who relocates to NY and find themselves in a building where the residents have made deals with the devils. I think this one could have teen appeal for sure! -According to Diablo Cody, her adaptation of Sweet Valley High for the big screen may end up being a musical. -Six of the nine Academy Award nominees for Best Picture have been adapted from books, including two middle grade novels, Hugo (from The Invention of Hugo Cabret) and War Horse (from the book War Horse). 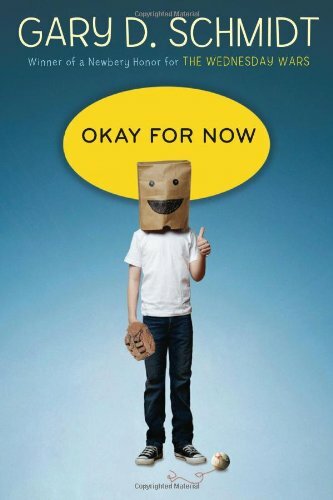 Early Word has a great round up of all book to movie nominees in all categories. I think an Academy Award Book Club would be a great library program! 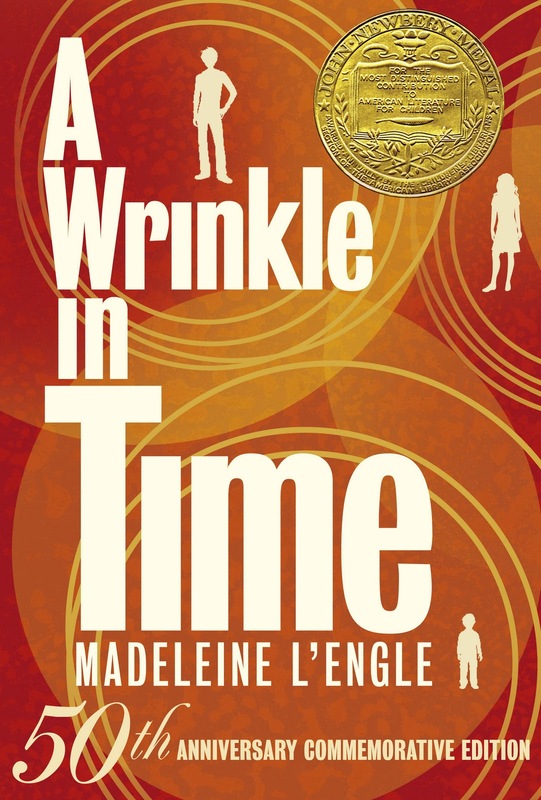 I'm telling you-if you love A Wrinkle In Time, you need to get a copy of this edition!! I've mentioned it several times before, but A Wrinkle In Time is one of my favorite books from my childhood. For me, A Wrinkle In Time is a book that stays with you and never lets you go. It's a book I still think about as an adult. From the first words, "It was a dark and stormy night" you can't help but be pulled in and want to escape into the pages. Growing up, I was much like Meg Murray. I felt like I didn't fit in, I had a terrible temper problem, and I felt a bit lost. Reading about Meg made me feel better. Meg could go on amazing adventures, save her father, and even win the affections of Calvin O'Keefe. If Meg could do it, so could I. And yes, I had a crush on Calvin-really, who didn't? I was a shy reader and every time I went to the library, all I really wanted was for a librarian to tell me about a great book to read or talk to me about books. But I was too shy to talk to them first. I knew where and how the books were shelved, I knew how to search the catalog, and I knew how to browse for exactly what I wanted, so I never approached the children's desk. And the librarians never really approached me. Now I work as a youth services librarian and it's my goal every day to reach out to those kids who are wandering in the stacks. They may already know about great books, but I know they're looking for more. I always love it when I come across that special reader who I can share a secret with-"have you read A Wrinkle In Time?" It's one of those books that you have to find the perfect reader and I feel it's a special book to share with my avid readers who are ready for this journey. It's a book for readers who are looking for something new and exciting. They have to want to journey with Meg, Calvin and Charles Wallace. They need to be able to accept new worlds and ideas of the tesseract. They must make new friends in Mrs. Whatsit, Mrs. Who, and Mrs. Which. A Wrinkle In Time is a very special book that deserves a very special reader. I love finding those readers and realizing that they, like me, are like Meg, or even Charles Wallace or Calvin. They will read the book and clutch it to them and reread it again after finishing. I love when they come back to the library and ask if there are more and I happily tell them that yes, the story isn't over yet! Sharing my childhood favorites with readers and reaching out to kids who I know need A Wrinkle In Time make my job the best job in the world. I hope I can continue to share Meg, Charles Wallace and Calvin's journey with many readers to come. 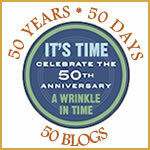 How will you be celebrating A Wrinkle In Time's 50th Anniversary? Opening Song: We always open toddler storytime with Finger Poppin by Georgiana Stewart. It's a bit annoying, but the kids love it and I see them walk into storytime popping their fingers, so I can never get rid of it! Book: Freight Train by Donald Crewes-my library has a big book copy of this one, which makes it more fun to read. 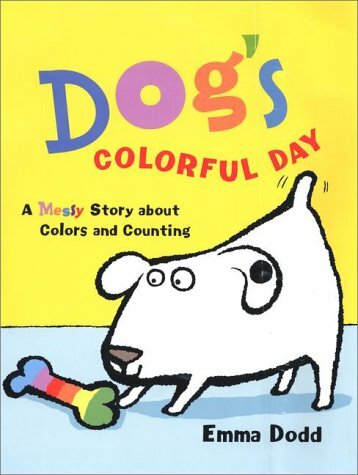 The toddlers love the big books and the simple text and colors of this one make it perfect for this age group. Song: These Are My Glasses by Laurie Berkner-I sing this every week and it's so fun to watch the kids learn it! 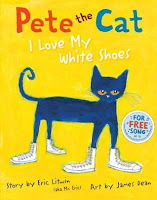 Book: Pete the Cat by Eric Litwin, illustrated by James Dean-one of my favorite storytime books and great for colors! (I changed it from wearing to holding, since I have around 25-30 kids in storytime and didn't want to have to sing every color they were wearing! I cut out pieces of paper in red, green, blue and yellow and passed them around the room." This rhyme was fun and easy to do and the parents helped the younger ones stand up when it was their turn. Flannel Board: Dog's Colorful Day by Emma Dodd-I made a flannel board (my first one!!) for Dog's Colorful Day using a pattern from the book Toddler Storytimes 2 by Diane Briggs. Zoom, Zoom, Zoom, Zoom, Zoom. -I love using scarves-it's basic movement and music skills, you can dance fast or slow, shake them up or down, side to side, and you can use whatever music you like! I love the For the Kids CDs-great songs for kids and it's not annoying for parents! 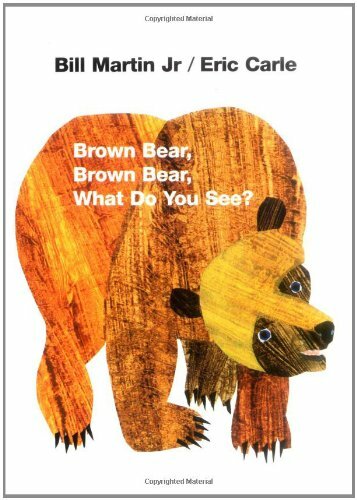 Book: Brown Bear, Brown Bear by Bill Martin Jr, illustrated by Eric Carle-what's a storytime about colors with Brown Bear, Brown Bear? Instead of reading this one, I sang it to the tune of Twinkle Twinkle Little Star. Book: From Head to Toe by Eric Carle-I end all my storytimes with this book because I love how interactive it is! Overall this was a fun storytime and the kids all really enjoyed it. The action rhymes were easy enough for the parents to learn (I wrote the words on the whiteboard so they could sing along) and the books were all a good length. Welcome to YA movie news! Lots of news happening this week! 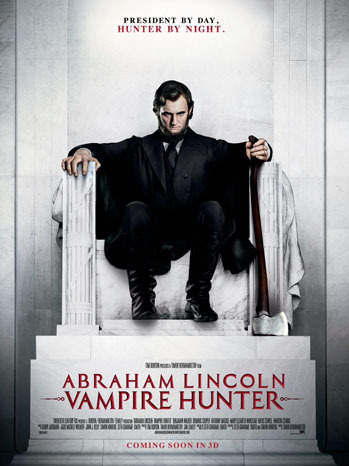 -I love this poster for the film version of Abraham Lincoln, Vampire Hunter. I think this movie will have tons of teen appeal! -Interesting news came across my e-mail this week in Cynopsis Kids. 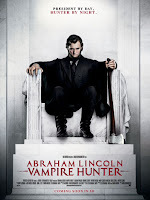 Lionsgate (The Hunger Games movie) will acquire Summit Entertainmet (The Twilight Films). Anyone else think they should just become a huge producer of YA books to movies? I can't decide if I find this marketing annoying or clever. -Speaking of Lionsgate and Summit, there may be talk about more Twilight even after Breaking Dawn is finished. I think with no more books to adapt they should stop. If it didn't come from the original author, I don't think they should make more. What do you think-should it continue? -Publishers Weekly featured an interview with the actress who plays Rue in The Hunger Games movie. I love that she's such a big fan of the books! -More news from Cynopsis Kids-The Hatchery and Jane Startz Productions will be producing movies, TV series and TV movies based on V. C. Andrews books. No word yet about if the movies are actually in production or just a possiblity. -The CW does has a couple of new shows in the works for next season. Carrie Diaries and Beauty and the Beast (a remake of the 80s Beauty and the Beast series) have the go ahead. -If you're a huge Twilight fan, you might want to check and see if your local Target store is hosting a midnight DVD release for Breaking Dawn: Part 1. Select stores will have parties which includes a new scene from Part 2. -Walking Dead returns February 12. Mr. GreenBeanSexyMan got hooked on this show and I think I'm going to have to give it a try! -If you're an avid Game of Thrones fan like me, you'll be happy to know season 2 will begin on April 1 on HBO. It's that time of year again! Bright and early Monday morning, librarians will gather in a Dallas ballroom and hear the announcements about this year's book awards. Last year was my first year I was able to attend the announcements live and it was so much fun! Being in a room as the winners are unveiled and sharing in the gasps of shock and cheers of happiness adds to the fun. Of course, it's always fun to predict what books will win, so here's the titles I think we'll be hearing called out on Monday morning. 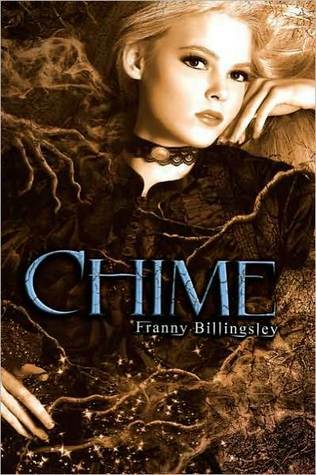 Chime has been my front runner since I read it back in March (I still need to review it, I know!) 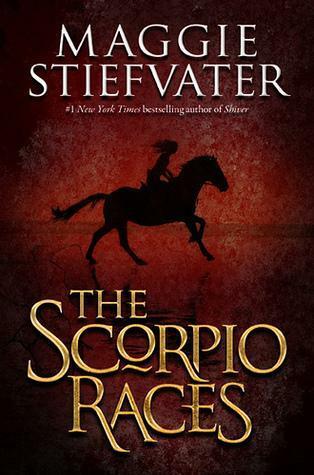 Fantastic world building and rich characters and an original story that's a bit historical, a bit magical, and all around amazing. I think it's the book to beat. 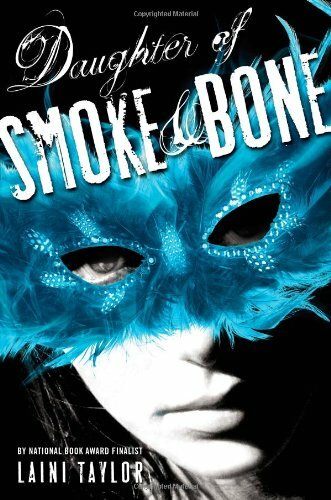 Both Scorpio Races and Daughter of Smoke and Bone have lush, descriptive writing that I think will carry them far during the award discussions. This could be a great year for fantasy when it comes to award! A.S. King is a YA superstar! 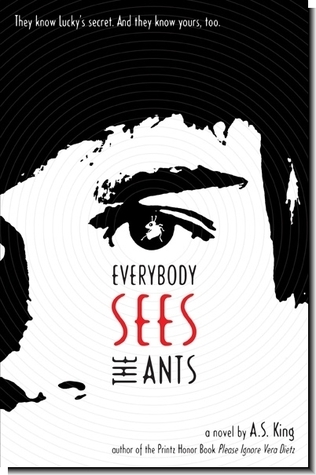 There is so much gold in Everybody Sees the Ants-Lucky learning how to deal with bullies, discovering who people really are, dealing with the absence of his grandfather and emotionally his father, and that age old coming of age storyline that we love so much. I'm eager to see if Ms. King gets back to back honors!! This is another book that's been the front runner since I read it earlier this year. 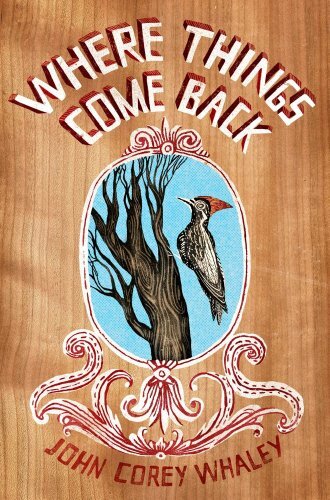 I haven't come across another book that I think stands out and Okay for Now is such a librarian favorite, there may be some revolting if this one doesn't win! 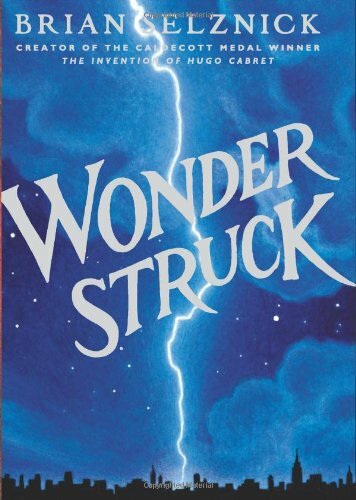 Wonderstruck is a dark horse mainly because there's been lots of discussion as to where exactly it fits into the award criteria. Will the committee deem it worthy or will they dismiss the art/text format? With a Name Like Love is my big dark horse pick. 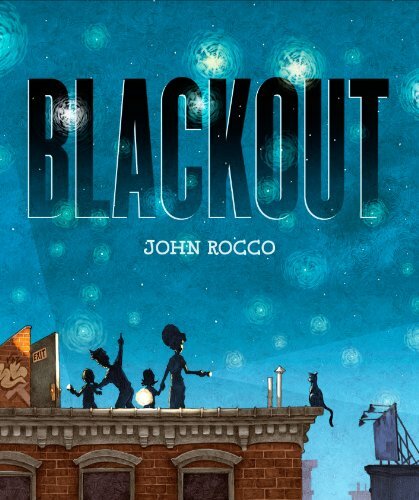 It's a wonderful debut and feels similar to other classic Newbery winners (it reminded me a lot of Jennifer Holm or Kate DiCamillo) It's a family story as well as a mystery and the characters and storyline is all nicely developed without being campy. I'd love to see some award love for this one! 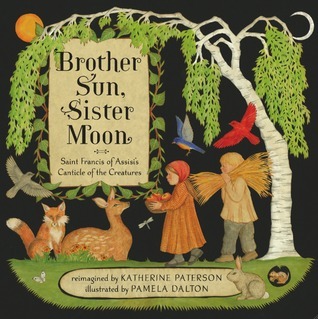 Brother Sun, Sister Moon has some impressive artwork. Each page features watercolor paper-cuts that have so much detail it's easy to pour over each page and get lost in the illustrations. It hasn't gotten much buzz, but I think it's one of the most impressive and stunning books of the year and I'm hoping the committee gives it a nod. 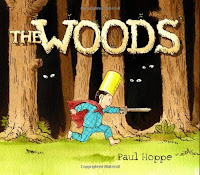 -I discovered this book earlier this year and decided to use it for a pajama time storytime. It's a great book for storytime. 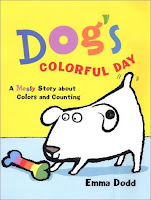 The text is simple and the illustrations are bright and colorful and perfect for a larger crowd. 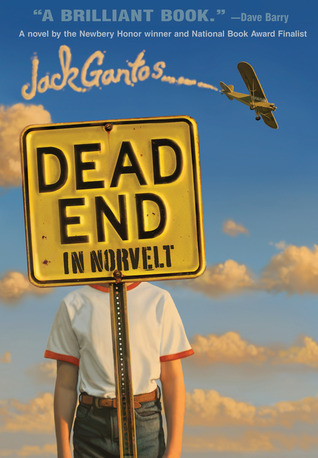 The story is about a young boy who is about to go to bed, but can't find his rabbit. He decides he must venture into the woods. Along the way he comes across several scary things-a bear, giants, and a three headed dragon-only to discover that they're not scary at all. Instead they need the boys help in some way. This is a great read about conquering your fears and using your imagination. 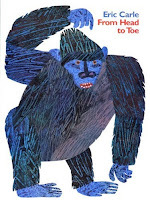 It was lots of fun to read in storytime and I recommend it as a read aloud! -Where's Walrus is a wordless picture book about a Walrus who goes on an adventure around town and the zookeeper who tries to catch him. The illustrations have a retro feel, which I love. 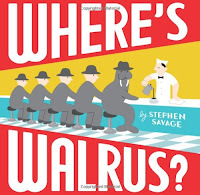 Walrus's adventures are hilarious and he's easy enough to spot for younger readers. I read this with my two-year-old niece and she had a blast pointing out where Walrus was on each page. 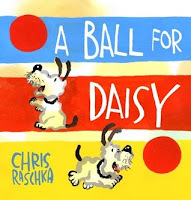 A wonderfully fun book for a lapsit with toddlers and preschoolers. -Good news Hunger Games fans! Movie tickets go on sale February 22 on Fandango.com. Mark your calendars and hopefully there will be a midnight showing in your area! -The Hunger Games marketing team has released a new site, Capitol Couture. The password was tweeted out the other day #lookyourbest and you can sign up for when the site officially launches. Doesn't Effie look crazy yet amazing?? -In even more Hunger Games news, Mockingjay.net has a great interview up with the stars about the pranks they played on the set. -Remember the Les Mis musical move? Well, Taylor Swift won out and got the role of Eponine and Amanda Seyfried will play Cosette. I was really liking the cast until the Taylor Swift casting. What are your thoughts? Are you still excited about the movie? As a kid, I thought this was excatly what happend in a bookstore or library when the lights went out! I love this video from indie bookstore Type in Toronto. 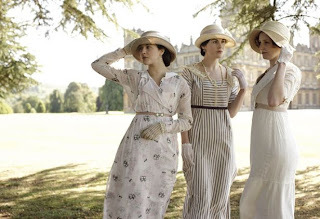 Welcome to the first installment of Sarah and Melanie's recaps/reviews of Downton Abbey Season 2! We're both excited to jump back into this show and we thought it would be great to share it with other fans. Share your thoughts! There are some spoilers from the episode, so read at your own risk. Also, please no spoilers for future episodes if you've watched ahead! Sarah: The episode starts off and we're at war and a time jump from the last episode. Two years have passed. Matthew is still alive and fighting in the war and slyly mentions that there's a girl he wants to see on leave. Will it be Mary?? I know it won't be, yet I also secretly wish it will. Melanie: The time jump really threw me off. There's so much I feel like I missed- I was really looking forward to seeing how the Countess dealt with her miscarriage. I was kind of surprised to see Matthew actually on the battlefield. I thought that as an heir, his blood would be too precious. Sarah: The time jump threw me off a bit too. I had the same feeling of missing things I wanted to know where people had been, what they'd been up to, etc. Two years is a long time! he would like. I like his heart and his good character, so seeing him realize he's getting older is a bit sad. Melanie: Grantham really does have a hard time with this. I wish he could realize how important a strong home front is. Even his wife isn't able to console him. Sarah: I also think this makes him more endearing-he has lots of moments like this in this episode where I just love him. Sarah: Yes! A fit of rage from Mary would be awesome! We know she has a mean streak in her-I'm waiting to see what she'll do to this poor girl. Sarah: There's a new housemaid, Ethel. She's kind of annoying and I'm not impressed. Even though I'm not an O'Brien fan, I have to admit that her pranks on Ethel were pretty awesome. Melanie: I'm kind of sad that we didn't get to see O'Brien cackling in glee over the pranks she pulled. They were pure genius. Sarah: They were and I have to give O'Brien props for them. I think that's the one time I wouldn't mind her cackling! Bates returns and YAY!-he proposes to Anna. Problem is he's still a married man. Oops! Bad move Bates. I wonder how he thinks that's going to work. I see drama in the future. Matthew arrives with Lavinia, his fiance, in tow. She's cute enough, but we don't really see much of her and I'm convinced that now Mary and Matthew must be together! They can match wits! Lavinia just doesn't look as smart. Also, her green dress is kind of frumpy. Mary and Matthew sit next to each at dinner (oh how sly you are with the seating arrangement) and it's clear Mary is still in love with Matthew. Matthew is daft and doesn't appear to notice, although I think he does. Mary arrives at the train to give Matthew her good luck charm. I mean, come on Matthew! Can't you see how she's changed?? I can! Seriously, in episode one, I've had a change of heart about Mary. She's much less annoying and I like her. I feel like she's finally grown up. Matthew in turn is just happy they're friends because he's dumb. Melanie: Haha, I agree Matthew is not using all of his wits. I think he's kind of ignoring her on purpose. I've been a Mary fan from the beginning, so I kind of want to smack Matthew upside the head. Lavinia's too good. I think she's hiding something. And who wears frumpy green dresses? Yet another reason to dislike her. Sarah: Excatly. She does seem too good. I'll be watching her with a suspicious eye. And I really am a Matthew/Mary fan more this season. Sarah: Bates's evil wife Vera shows up and turns out she's not going to give him a divorce. Instead, she demands he come with her, or else she reveals Mary's scandal (or as Aunt Rosamund says later-the blot on her copybook). She blackmails Bates and Bates is a good guy and doesn't want to hurt Anna. This makes me like him even more. I mean, he's going off with the evil blackmailer just to keep Anna in good standing! Man, I want them together!! Good news is, Mrs. Hughes has awesome spying abilities thanks to the vent in the kitchen and she overheard the real reason Bates is leaving. Here's hoping Mrs. Hughes will save the day later!! Melanie: This is the one time in my life I will ever condone eavesdropping. In this case alone, rock on Mrs. Hughes! Sarah: She shares with Carson, but I'm interested to see what she'll do, if anything, with this information. Rock on indeed! Melanie: Poor Sybil. She's so confused. But would she really be willing to live the life of a chauffeur's wife after growing up as aristocracy? She may be more like Mary than we'd like to think. Sarah: Oh no! Don't say that! Sybil is my favorite! :) But you make a good point. I wonder if working as a nurse will change her. More romance! William is feeling down and Daisy kisses him. Oh Daisy, you're so naive. If you don't want a boy to like you, don't go kissing him. Of course he's going to think you're his girl! Daisy later confides that she doesn't like William. He's finally be able to enlist and is being sent off to war. 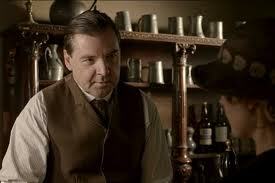 Mrs. Patmore tells Daisy she can't send him off with a broken heart. I agree and I think there's something wrong with Daisy. She's led him on for a long time-that's just mean. Daisy, I still don't like you. Melanie: I'm sort of on the fence about Daisy and William. They're both so immature and young. 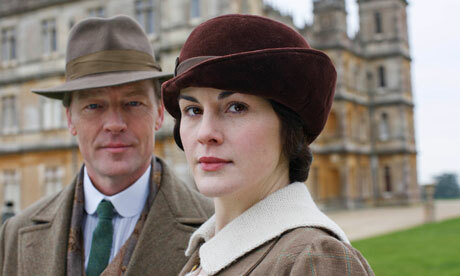 Out of all the characters at Downton Abbey, I think these two act their age the most. Sarah: Agree! They are immature and I really don't like that she's been leading him on for so long. Thomas is still annoying. He's been fighting in the war, but he holds his hand up with a light so he would be shot at, therefore becoming injured and being sent home. It's a tough moment to watch, but I'm not sure I like him. 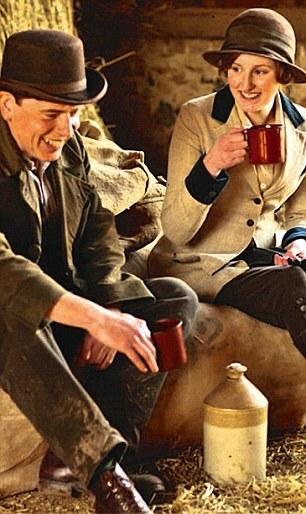 Melanie: He had tea with Matthew right before doing that where they talked about the old times. Thomas' courage comes out in odd ways, while sticking his hand in the air must've taken guts, it also shows how much of a coward, ultimately, he is. Sarah: Good point. His courage does come out in strange ways, and in some ways I feel a bit bad for him. Time jump again. It's now 1917. There's a new footman, Lang, who is suffering from shellshock. O'Brien, in a moment of compassion, recognizes this and is kind to him. There are moments when O'Brien is very human and shows heart and I think that's what makes her character so rich. Melanie: Absolutely. O'Brien's brother suffered from shellshock as well, making her aware of an all too common, yet at the time misunderstood, ailment. Sarah: Thomas has returned and he's back to looking swarmy as only Thomas can. He's helping Sybil out in the hospital, helping a young soldier who was blinded in the war. Thomas and Sybil are working to help him recover, only to find out that the head Doctor is sending him away to make room for the newly injured soldiers. The young man kills himself. 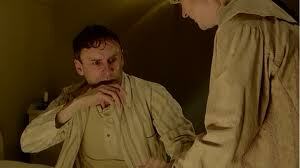 This leads to another moment of caring for Thomas as he shows emotion at the loss of the soldier. This show is so good at tugging at your heart strings and making you rethink what you originally thought about characters. Isobel suggests that Downton Abbey becomes a convalescent home. 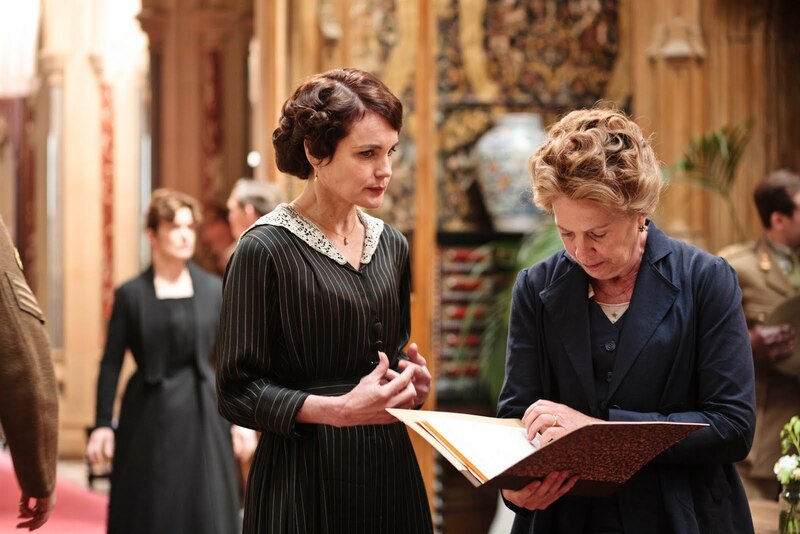 Violet isn't for it, but she gets voted down and I can't wait to see how this changes things at Downton. Again, this shows Lord Grantham's compassion and I think it's what makes him a great character. I always want to think that aristocracy has a heart and showed kindess to their serving staff. Lord Grantham does this and it makes me really care about him. Melanie: That scene where Thomas tells the blind man he can't give up give up and has to fight back gives a lot of clues into Thomas' past. It reminded me of all the strife Thomas must have put up with for being homosexual Being gay in this time period must have been hell. Sarah: And then when he cries because the soldier has killed himself? Heartbreaking. I think we're getting to see antoher side of the conniving Thomas, again proving how rich in development these characters are. Sarah: Mary has made a friend in newspaper man, Sir Richard. 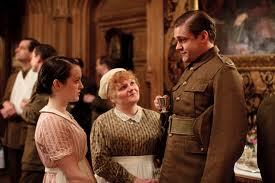 He visits Downton Abbey along with Aunt Rosamund. Mary, feeling conflicted, seeks the advice of Carson, which is probably my favorite scene in episode one. After working himself too hard, Carson has been put on bedrest. His talk with Mary is sweet and you can see that he really cares about her. Mary also seeks the advice of Anna, who, along with Carson, encourages Mary to tell the truth about her feelings to Matthew. Mary tries to tell Matthew, but finds Lavinia crying because Matthew is to leave early. She ends up backing down and not saying anything, which is a really bad decision. Just tell him already! Mary instead gets a proposal from yucky Sir Richard. UGH! I don't like Sir Richard. He looks old and like he's wrinkly and leathery like he tans too much. I also don't trust him. Mary's not excited by the proposal, but says she'll consider his offer. I hope she turns him down! Melanie: Carson's scene with Mary is my favorite of this entire episode too! He's almost like a grandfather to her, and it's so sweet to see. She let's him close to her. It kind of makes me wonder what Mary would be like with a man romantically if she let him close to her. She's got a lot more heart than she's showing.I'm afraid I'm not as against Sir Richard. Maybe Matthew seeing Mary with someone else would knock some sense into him. I like seeing Mary's emotional side warring with her rational brain. She definitely has a heart, no matter what Mrs. Hughes says. Sarah: Yes, she is showing more heart this season. And good point about her opening up romantically. 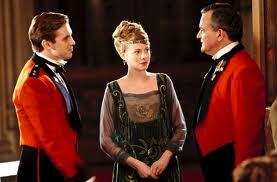 I think the war has made her see that she can't be a snobby aristocrat, things are changing and it is effecting her. I like seeing her emotions and her rationality at war as well. 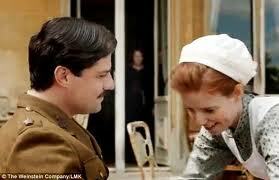 Mosley begins to seek out Anna, lending her a book, and suggests they spend more time together. This is heartbreaking to watch, because you can see Anna loves and misses Bates. Melanie: When Mosley hits on Anna, I kind of feel sorry for him. Their social circle is so small, it's not like there's a bunch of available women around. Yet it also shows a profound lack of perception on his part. One look at Anna, and one can tell she's not nearly ready to move on. Sarah: Edith has been learning to drive and visits a local farm to help out and drive the tractor. She begins a flirtation with Mr. Drake and they kiss one night. But silly Edith, his wife was watching and writes Edith a note that they've hired a boy and she won't be needed anymore. 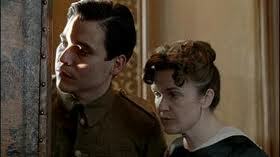 What's with Edith getting all the bad romances? And why does she always go for awkward old men?? Melanie: I know! I don't like Edith at all. Kissing a married man? She doesn't seem to be using her brain. She's my least favorite of the three sisters. I have to admit, watching her drive the tractor was kind of funny. Sarah: It was! I was cheering her on and hoping her character would change a bit as well, but I she's still my least favorite of the sisters. I also don't think her mean streak has left her. I hope she doesn't take it out on Mrs. Drake! Aunt Rosamond overhears a conversation between Sir Richard and Lavinia and apparently there are some secrets between them. We already know that Sir Richard was an acquaintance of Lavinia's father. It appears that there may be some scandal in Lavinia's past and I'm eager to find out what! Maybe this will break up Lavinia and Matthew? I really hate love triangles, so I don't want this one to be drawn out forever!! Melanie: I'm ready for some Mary/Matthew time! Lavinia's got some dark, terrible secret, I think. I want her far, far away from Matthew. I'm thinking that Richard and Lavinia may have been involved with each other at some point. I could be wrong, though. It's just a theory. Sarah: Oooh..I wondered the same thing! I wonder how Matthew will react. I also wonder if he'll ever find out about Mary's scandal and what he would think of that! So that's Episode 1! There is lots going on and I can't wait to see how it all plays out. So much drama, intrigue and romance! No wonder we're hooked on this show!! Sarah: Like many fellow bloggers, I am eagerly awaiting the Season 2 premire of Downton Abbey Season 2. Because we love the show so much, Melanie from Melanie's Musings and I have decided to co-host episode recaps. I've been good and kept away from spoilers about Season 2, so it will be fun to watch and discuss each episode. Being able to talk about the show adds to the fun, so we hope bloggers will join in our discussions. Melanie: Unlike Sarah, I haven't been quite as good on keeping away from spoilers. Thankfully, I haven't come across anything too serious, but I may know about one twist. I can't wait to see it happen, especially since I have no idea where it occurs. Sarah-I LOVE this show. I was telling a friend of mine that for some reason watching soapy drama with a historical setting feels more sophisticated. You can't deny that there is plenty of soapy drama in DA, but it's just sooo good! Sarah-Matthew is a great TV Crush. I'm a bit torn on if I want the Matthew/Mary hookup to happen. She was so mean and horrid to him and I don't know that she's gained any redeeming qualities. I kind of want Matthew to go off and find some other girl who is awesome, but considering Season 2 takes place during World War 1, I don't know that he'll have much time for love. Maybe Mary will get better in Season 2? Somehow I doubt it. Sarah-Season 1 has been a lot about Lady Mary and I'm hoping Lady Sybil and Lady Edith get some good storylines in Season 2. I want something new to create drama. 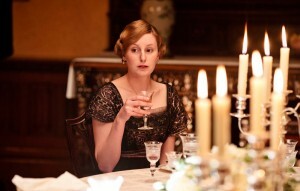 I really don't know if I like Lady Edith either-so this will be her chance to win me over. 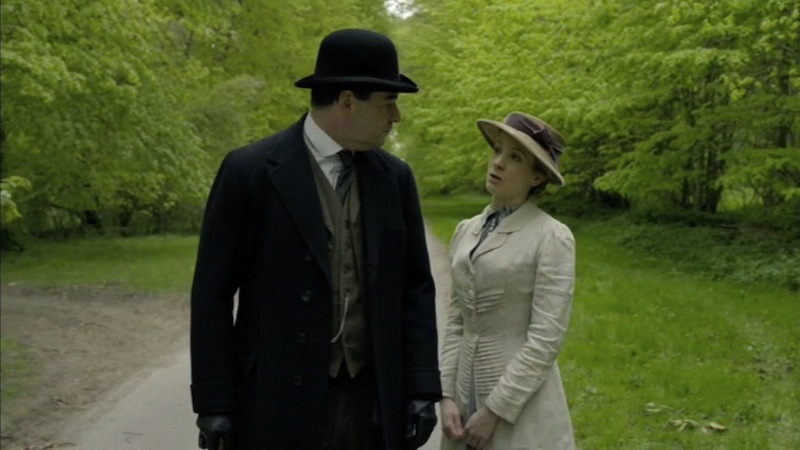 Really, I think with all the bickering and backstabbing between Lady Mary and Lady Edith, I'll end up annoyed and disliking both of them. Lady Sybil is my favorite. 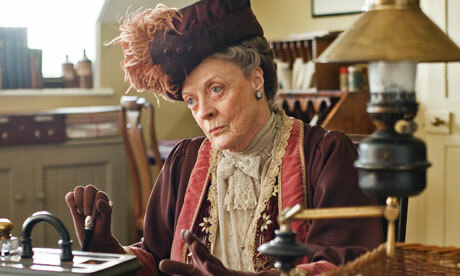 I'm also hoping for a secret upstairs/downstairs romance with her and Branson! Anyone else with me?? Melanie: I actually kind of like Mary, or at least I find her the most interesting. 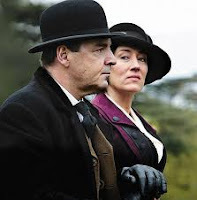 I think interesting things could happen between the family's chauffeur and Sybil this season, though. (From Sarah-we will both be rooting for this-I'm not alone! :) They went through some pretty bonding stuff in Season 1. Sarah-O'Brien and Thomas-the evil villians. They're so bad it's good. You can't help but hate them, yet you also want to watch them to see what they'll think of next. It really is bad guys done right-they're so dasterdly and it's fun to get mad at them. Anyone else cringe when Cora slipped on the soap and killed her baby? O'Brien is so terrible and petty, yet it makes a brilliant storyline! Melanie: I love watching O'Brien and Thomas, the main villians, because while I agree they're mostly evil, every once in a while they'll have a very human moment that gives me hope. Sarah: Agreed. I think that's what makes them so great. You're so right about them having a moment where they are very human and almost show compassion. I think that's what makes them so interesting. Melanie: Daisy irritates me too. I hate it when girls fall for the wrong guy. The other man (I can't remember his name) is always so nice to her and she brushes him off! Sarah: Me too! She needs to stop being so in love with Thomas and see what's in front of her. Sarah-Bates and Anna! Love them, they're adorable, yet I know there's not going to be a nice happy ending. These two are going to have to face a lot of drama. I spent most of Season 1 wanting to scream at them "can't you see you like each other!!" 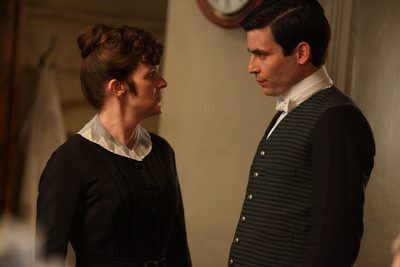 I hope we see more from Bates and Anna and I hope their relationship develops. I also think the show is very lush and gorgeous and makes me want to go back in time (well sort of, only if I could be a Lady with amazing clothes, I think.) And the costumes-they're amazing, right?? Melanie: I definitely agree that I would only want to time travel if I could be a part of the aristocracy. I've never been very good at peeling potatoes. Sarah: Yeah, I'd be a terrible maid. 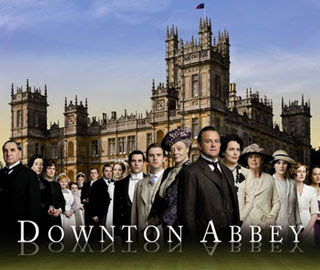 I can't even keep my own house clean, let alone a mansion like Downton Abbey!